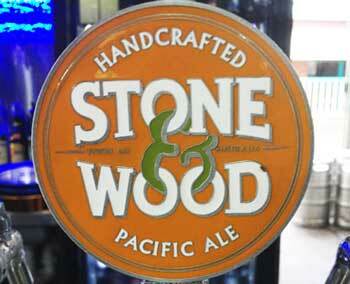 What: An Australian craft beer; a “Pacific-style” pale ale from Byron Bay’s Stone & Wood Brewing Company to be precise. According to the Stone & Wood website, this beer was inspired by the brewery’s home on the edge of the Pacific Ocean and brewed using all Australian barley, wheat and Galaxy hops. After being dry hopped at the edge of fermentation, the Pacific Ale is then drawn straight from the storage tank at the brewery into kegs and bottles – so the beer will be as fresh as if it had come straight from the tank (which it has, essentially). Where: I enjoyed (whoops; there’s a spoiler for you!) a small glass of this craft beer, alongside several others from across Australia, on a sample paddle at Cargo restaurant and bar at the Melbourne docklands. Then, once I’d finished all the samples, I ordered a whole glass of Stone & Wood Pacific Ale. According to Cargo’s beer menu – which is very good, incidentally – this is one of “Australia’s most loved craft beers”. Tastes like: A true crowd pleaser. As mentioned, I enjoyed my tasting of Stone & Wood’s Pacific Ale so much that I simply had to order a larger glass. Slightly hazy in appearance, this lovely beer is moderately sweet with a tropical, fruity taste, and a crisply refreshing finish. It’s relatively hoppy, though it’s obviously much lighter and easier to drink than an IPA; indeed, I found it better balanced than even your typical pale ale – I could drink this beer all night long. Is it the best beer ever? I tried Stone & Wood’s Pacific Ale alongside a Cornet Strong Pale Ale from Belgium, Australia’s Feral Hop Hog IPA, and a porter by American craft brewery Founders Brewing Company, and I reckon this could have been my pick of the bunch. The editor of Best Beer HQ is currently on holiday in Melbourne, so keep an eye out for some more reviews of Australian craft beer in the coming days and weeks (including of the beers mentioned above).